SACRAMENTO, CA - Momentum continues to build for one of the most important disclosure bills in the nation, AB 249, the California DISCLOSE Act, as the bill acquires its first endorsement from a statewide labor organization, the Communication Workers of America, District 9. "The Communications Workers of America (CWA), District 9 strongly supports AB 249, the California DISCLOSE Act," said Tom Runnion, Vice President of Communications Workers of America, District 9. 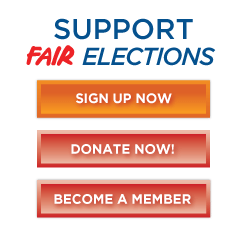 "We firmly believe that requiring clear disclosure of the largest funders of ballot measure advertisements would benefit both working families and voters in California." Under AB 249, all ballot measure advertisements and independent expenditure ads for or against candidates will be required to display their top 3 funders on a solid black background on the bottom third of the screen for 5 seconds in television and video ads. Each name must be displayed on a separate line in a large clear font. Similar disclosure rules will exist for radio ads, print ads, and robocalls. Perhaps most importantly, AB 249 creates new follow-the-money rules for earmarking contributions to ballot measures in order to identify the true funders when they try to hide behind front groups with misleading names. These rules will apply whether the original funders are unions, corporations, or billionaires. No other disclosure law in the country does as much. "It's great news that the District 9 Communication Workers of America are supporting AB 249," said Assembly Speaker pro Tem Kevin Mullin, author of AB 249. "As we continue our efforts to garner support for reforming financial disclosure in California's ballot measure process, endorsements from groups like the CWA help build positive energy and momentum." CWA's endorsement adds to the extremely broad support for AB 249. Last month, the California Clean Money Campaign, sponsor of AB 249, delivered signatures from 81,801 Californians for the California DISCLOSE Act, all gathered in 2017. One of the largest ever coalition petitions for state legislation formed behind AB 249, including 23 state and national good government organizations ranging from Common Cause, Maplight, Money Out/Voters In and Public Citizen to Courage Campaign, CREDO, Daily Kos, Fight for Reform, SumOfUs, and the California League of Conservation Voters. "We are very happy that the Communications Workers of America District 9 has added their voices to the broad coalition behind the California DISCLOSE Act," said Trent Lange, President of the California Clean Money Campaign, sponsor of AB 249. "Californians from all walks of life have been crying out for truth in political ads. It's time to stop ballot measure ads from lying to voters about who paid for them." Californians from all major political parties have overwhelmingly stated their support for greater disclosure. A poll by the Public Policy Institute of California in October 2013 found 84% of likely California voters favored legislation to increase public disclosure of funding sources in initiative campaigns. Those in favor included 80% of Republicans, 81% of Democrats, and 85% of Independents. An earlier Field Poll showed that 84% of California union members and 83% of tea party members favored increasing public disclosure requirements of initiative sponsors to more clearly identify the major funders. "This should not be controversial. Labor funders almost never hide on ballot measure ads," said Tom Runnion, Vice President of CWA. "AB 249 will stop voters from being routinely and legally misled about the true funders of such ballot measure ads in the future." DISCLOSE is an acronym for Democracy is Strengthened by Casting Light on Spending in Elections.